There’s a lot to love about spring in New Jersey. Plan a weekend getaway at these hidden gems. Find out what's going on in New Jersey. The guide highlights hundreds of events and happenings. With so many distinct places and experiences, New Jersey is well worth taking the time to explore. Start with the beaches along the coast. Each town has its own personality, from the wooden boardwalks and brightly lit resorts of Atlantic City to the family-friendly attractions and sweets shops of Ocean City. 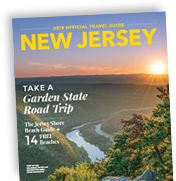 Head into northern New Jersey for picturesque mountains and move inland for forests and trails revealing waterfalls and other natural treasures. Throughout the Garden State, find inspiring museums celebrating the history and culture. Your resource to find locally grown fruits and vegetables in the Garden State! No matter what you are shopping for New Jersey is the place where you will find unique treasures and great deals.